Valsamoggia (Bologna, Italy), 29 January 2019 – On today’s increasingly competitive market, in which rapid delivery is essential for success, a distribution network able to offer a just-in-time service makes all the difference. Proof comes in the form of the Varvel Group, specialists in the design, production and sale of gearboxes since 1955. 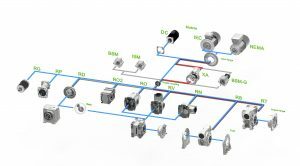 The need to keep customers in all parts of the world constantly supplied while minimizing stock in distributors’ warehouses, and a range of gearboxes offering many thousands of possible configurations were the two elements that encouraged Varvel to develop the concept of modularity and design end products that could be configured in just a few simple steps using kits. Today, modular design is a key strength and has made Varvel a model for advanced Italian engineering. Varvel is present in over 60 countries around the world. In the year 2000, the company decided to extend the concept of modularity already applied to its worm gearboxes to its entire product range. Varvel’s parallel shaft and bevel-helical gearbox and gearmotor ranges were the result of this decision. Today, Varvel’s entire product range, which extends up to 3,400 Nm of transmissible output torque and 22 kW of installable power, is designed and made using modular kits to create thousands of different configurations. Every parallel shaft and bevel-helical gearbox is made up of an input kit (motor flange and coupling), an intermediate kit (gear pair) and an output kit (casing, output shaft and gear train) to which accessory kits (like torque arms, feet, flanges etc.) can be added. Within each size, kits can easily be selected to create different gearbox types (parallel shaft or bevel-helical), different reduction ratios and an impressive choice of outputs (shafts) and inputs (motor sizes). The main beneficiaries of such high modularity is Varvel’s distribution network of over 100 commercial partners around the world. Varvel’s modular kits have led to a dramatic reduction in stock and lower costs for distributors and dealers while permitting an excellent level of service. This win-win solution has proved a tremendous advantage not just for Varvel but for all stakeholders. Modularity has brought with it an economic and competitive advantage that is achieving excellent results even in the United States, where Varvel opened a subsidiary in 2017. The US market has responded to the Varvel formula in an extremely positive manner and Varvel’s high modularity is proving a distinctive feature with respect to the local competition. The Varvel Group is therefore consolidating its reputation as an excellent partner and a socially responsible company that can deliver top quality products and services with a focus on people. Varvel’s emphasis on modularity is not just a matter of strategic marketing but also a major enhancement for distributors and dealers, who can add value to their local services and play a far larger role without incurring excessive costs. In business, everybody has to perform to the best of their ability in pursuit of a common objective. In this context, modularity represents a valid systemic model and a way to optimize the supply chain to the advantage of all concerned.